Do you remember that song that Alfalfa sang to Darla in the Little Rascals? I used to love that show as a kid. With Valentine's Day quickly approaching, my thoughts have been turning more and more to love, and family. 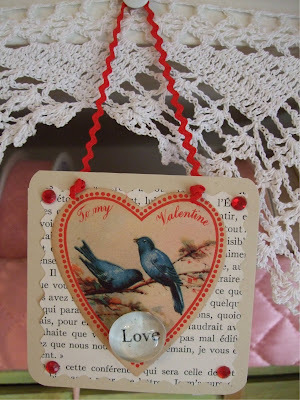 I keep thinking I will make some vintage inspired valentines or some kind of heart craft, but laziness is keeping me from doing so. This time last year I participated in my very first swap. It was called the itty bitty valentine swap. We were partnered up and were suppose to make some kind of valentine no more than 3 x 3 inches. I had such a fun time stretching my creative muscles making mine. I actually made four instead of one. All different. I apologize to those of you who have seen these before, but since I haven't been very creative lately, I will share them again. 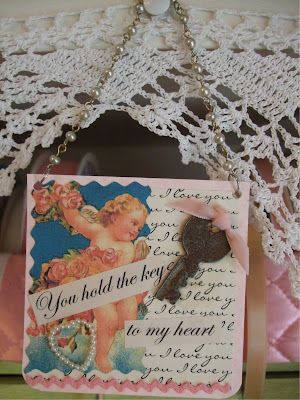 Here are a few more Valentine's inspired images I found around my house that make me smile. 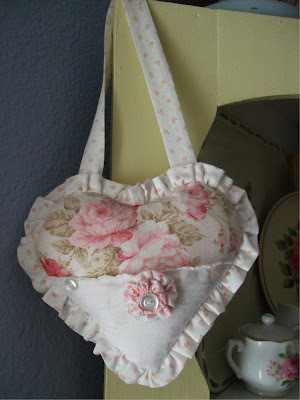 The sweetest heart pillow made especially for me by Becky at Sweet Cottage Dreams. She is going through a really tough time right now. Please keep her and her family in your prayers. Little X and O letters I purchased at Monticello recently. 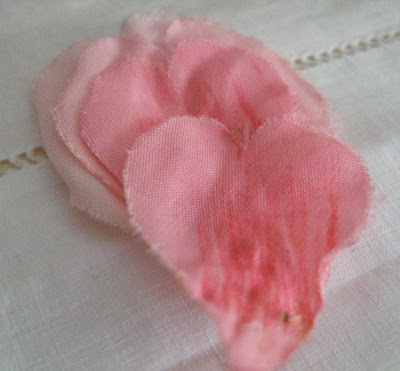 I was taking apart a vintage floral hat and a few petals fell off that look just like pink hearts. So sweet. 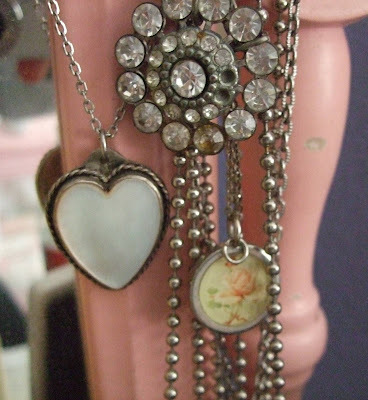 Pretty mother of pearl heart necklace I got from my friend Susan at the Clark County Antique Show last year. I begged my Mom to give me these two cuties and she finally did. Just looking at them makes me happy. 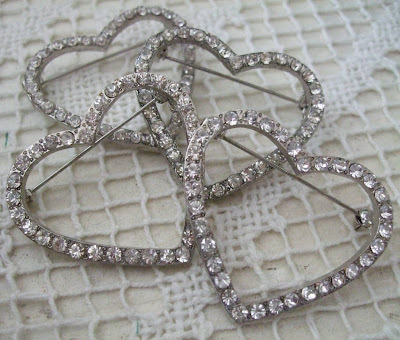 Four rhinestone heart pins I found this week at Value Village. 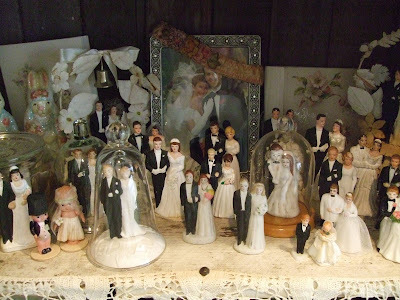 My wedding topper collection is a must add to my images of love. And finally, love birds times two. The picture of me and my hubby was taken in 1987 or 1988, can't remember, but I do remember that it was the first time my family in California met him. That's it for now. I'll be back later with a fun recipe, and will share some of my favorite vintage valentines. Hope you are all having a wonderful week! All your little creations were so pretty! I enjoyed all the pictures. And Ann and Andy...... What more can you say? Don't you just love the little things that make you smile? I love hearts. 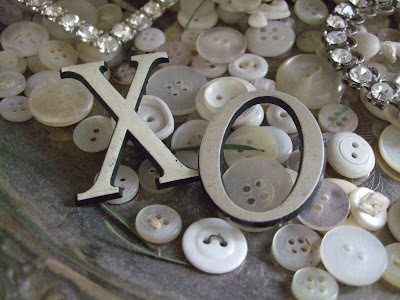 Your blog just made me smile smile smile~ and those pins from VV...so very sweet! thanks for sharing, I needed a smile! I like how those pink petals came apart and look like hearts. Sweet! 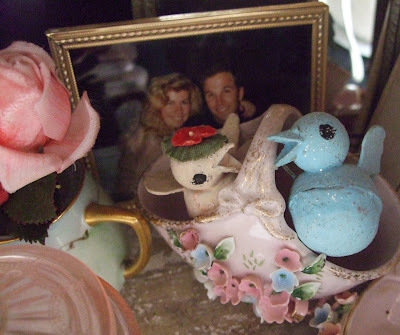 I have that same little bluebird that's in the last photo, and also that same pretty container that he's in! It holds glue sticks on my work table. 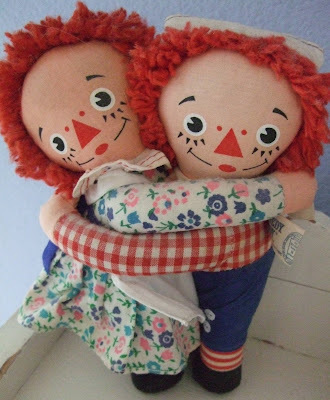 aw...such great pictures...thats a cute one of you and your man!! 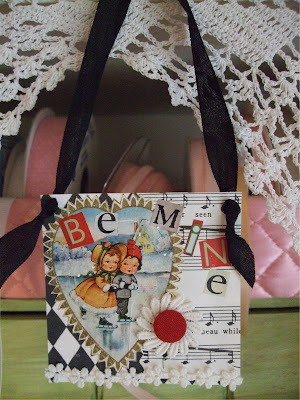 you are very talented....I ♥ all of your valentine things...love the cake toppers!!!! little things always make my heart flips.. and yours did the same to me.. all so pretty..
Lisa...what fabulous things you have to share again! 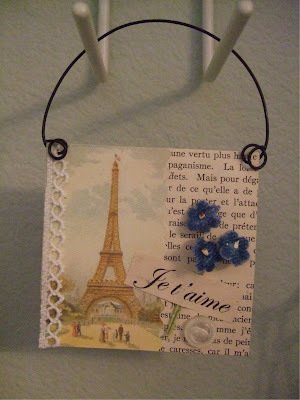 Well I think those are darling collages and a sweet photo of you and your sweetie. ALL cute! i will be back to see your valentines but for now...I love your grooms and brides!! Lovely blog! !